Ahh...That bean bag is well-made! Ahh bean bag chairs come with three parts: a Cover, a Liner, and Filling. Together, they make very comfy round (not ugly pear-shaped) bean bag chairs. Our round bean bags are preferred by decorators and designers worldwide. Covers are the "outer" shell of Ahh bean bags. They are handmade in the USA and double-stitched with quality materials for exceptional beauty and long life. We use top quality thread, fabrics, and zippers. Unlike other bean bags, ours are sewn like a baseball. Other bean bags use many panels and look like an orange with sections. It's much cheaper to make a paneled bean bag chair, but this style shows more seams and doesn't look nice. Our seams, on the other hand, are hidden and look more "finished". Note: paneled bean bags are egg-shaped, that's why they have 3 measurements (width, depth, height). Our round shape has a simple diameter measurement. Liners hold the filling, allowing the cover to be removed and washed. They are handmade and double-stitched. They simply won't break. We use an extremely strong, water-repellent microfiber - water beads right up! Other bean bag chairs use cheap, thin cotton or poly/cotton liners. What if you spill a drink on your bean bag chair and it soaks right through to the filling? What's the point of a washable cover if the inside is sticky and stinky (or worse, mildewy)? And what a mess when they break! All liners have a self-locking, child-resistant zipper that makes refilling easier, but keeps your child out of the filling. You can buy bean bag liners separately, too. "Our shredded-foam-filled beanbags are impossible to refluff and we had the small size one! What a stupid product! We replaced them with your filling and love it!" -L.M. We offer 2 kinds of fill: reground pellets and virgin bead. "Your product is awesome!! We are in need of fill now for our 2 bags and have found that your fill is better than cheaper stuff out there. Thank you!" -S.L. 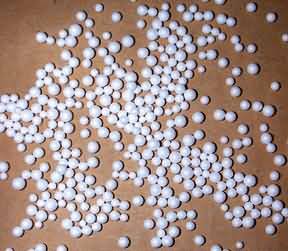 Virgin: BB-sized polystyrene (styrofoam) pellets that are perfectly smooth and round, about 3mm wide. The "real deal" - no cut up peanuts, no huge beads here (the huge beads squish more)! Because the beads are all the same shape, they shift around each other better when you are positioning your body in the bean bag. Virgin is also more dense than reground, so it holds its tight, round shape well. It does go flat eventually though, and how fast you have to refill depends on how much you use your bean bag and how poofy you like it. Some people refill within a few months (their kids use the bean bags as landing pads), some never refill and like them flat. Virgin costs more than reground. **We have very limited quantities of SUPER MICRO Virgin Beads, which are 1-2mm wide. Reground: Also known as "pre-consumer recycled" (our reground is not pre-used). 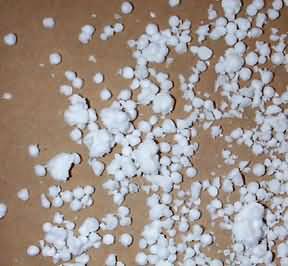 Large blocks of polystyrene (styrofoam) are ground up to make small pellets. Most pieces are bb-size, 3-4mm pellets, but there are some pieces that are made up of several pellets stuck together. It is not dirty or used, and does NOT come from paper cups, plates, shippng peanuts, etc.! When you are positioning your body in the bean bag, it takes more effort than with virgin fill. (We don't think it takes that much more effort, though.) Most bean bags sold today are filled with reground. We like reground refill because it is better for the environment. Why make more non-biodegradeable stuff to throw in landfills? We polled a sample of 300 people from our customer base and reground was preferred 3 to 1 over producing new virgin styrofoam. People with autism or sensory processing deficiencies tend to prefer reground. *Reground may contain non-white pieces, they are the same pre-consumer polystyrene as the white pieces. Can't decide? If your priorities are lower cost and the environment, choose reground. People with sensory issues prefer reground. If you don't mind paying a little more and easy-positioning is key, choose virgin. CAUTION: Keep plastic bags and filling away from children. Plastic bags and the small pellets when breathed in can cause suffocation! Loose filler is for filling products that have child-resistant, self-locking zippers or are permanently-sealed only. By purchasing this product, you are testifying that you are at least 18 years old and will use this product only for its intended purpose. Do NOT store near heat or flame. How often do I have to refill my bean bag chairs? Answer: It depends on how much you use it, how you use it, and how poofy you like your chair. If it's used a lot by kids who jump in it, then some folks call within a few months to refill. Some never need refill because they like it flat. The average is about a year. The GOOD NEWS is: we rarely sell refill to the same person more than once for the same chair. The fill does not disappear, it just deflates, so 1 refill normally does the job. It's not an on-going maintenance issue, unless you've got people jumping into them or on them. Fortunately, unlike other bean bag companies, Ahh! Products customers get filling at a discount and our liners can actually be opened (see next FAQ about how to unzip your liners). The following chart will help you determine how much refill to buy to refill our bean bags, assuming they are about half-flat. Why don't you use real bean for bean bag filler? Answer: Real beans, buckwheat hulls, latex, etc. are really heavy when you fill an entire chair with them! Imagine the weight of 150 or more bags of beans from the grocery store! ...definitely takes away the easy portability AND it can be dangerous if someone gets trapped underneath! Plus, since they are natural vegetable materials, we worry about possible mold or other issues that may arise. *for the 27" and 32", you may have leftover refill. You likely need less than 4.5 cubic feet, but we do not offer smaller quantities. *TB117-2013 requires that: "Manufacturers must mark an “X” next to the applicable statement. For the purposes of the disclosure, a product contains added flame retardant chemicals if the chemical is present in amounts above 1,000 parts per million." Although some filling we get from our suppliers has a flame retardant amount LESS THAN 1,000 parts per million, we feel it's totally misleading to check the box that says "contain NO added flame retardant chemicals". Because it does have a flame retardant! That word "added" is confusing to the average consumer. To be more clear, as with all bean bag companies, to comply with CA TB117-2013, products manufactured after 12/31/14 must be labeled a certain way. This makes them compliant. It is not required that they are flame retardant free. CA TB117-2013 specifies parameters on how to label your bean bag, not that it doesn't have any FRs. Ahh! Products errs on the side of caution and labels products produced in 2015 and later to disclose that we DO have flame retardants, even if we could potentially select the TB 117-2013 option that we do NOT have "added" flame retardants because the flame retardant amount on some of our filling is below a certain threshold. CA TB117-2013 can be misleading and some companies are taking advantage of the confusing wording. Please contact us directly for more information - we are happy to answer with complete honesty! If someone tells you their polystyrene does not have ANY flame retardants, you should question them thoroughly. Remember, our covers and liners do NOT have flame retardants (except "Kinetic Energy-Plum"). Bonus: customers with Ahh bean bags get discounts on filler! All bean bag chairs are upholstered furniture, which also fall into a special category because they are filled. As such, all bean bags are legally required to include labels with information about the manufacturer (name, address, Uniform Registry Number) and what the filling is. In most cases, it should also include flammability information. With this information, consumers are safer. Especially because children often use bean bag chairs, it is vital that you know what is inside, if it meets US flammability standards, and who to contact if you have problems. Manufacturers that stand behind their products will have this label for all to see. Recommended age is 3 and up. You don't have to buy cheap bean bag chairs to get a good deal. Take advantage of our specials page instead to get a top quality bean bag chair for a fantastic price. Our quality will give you the best value in the long run! because bean bag safety IS important.